Bring a large pan of salted water to the boil, tip in the kale, cook for 1 min until wilted, then drain and run under cold water until cool. Squeeze all the water from the kale, then put it in a food processor along with the reserved garlic cloves, chestnuts, lemon juice, olive oil and some seasoning. Blitz to a thick pesto, and season to taste. On a lightly floured surface, unravel the sheets of puff pastry. Cut each sheet into three (width ways) so that you have six strips in total then divide the kale pesto between these, followed by the roasted veg and lentils, heaping the mixture on top of the pesto and leaving one side free of filling so that it is easier to roll. Brush all the borders with half the milk, fold over the ends, then carefully roll the pastry lengthways to completely encase the filling into a roll. Place your six individual Wellingtons on a baking tray lined with baking parchment and chill for at least 1 hr, or cover with cling film and leave overnight (If freezing, cover and freeze on a lined baking tray for up to 3 months). To bake from chilled, heat oven to 190 C/170 C fan/gas 3 and line a baking tray with parchment. 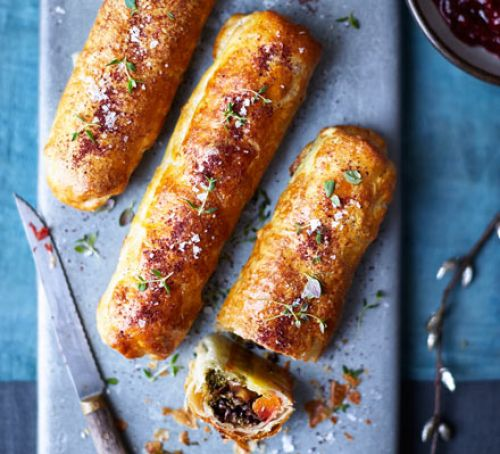 Brush the top of each Wellington with the remaining milk and sprinkle with a little sumac, then bake for 30mins from chilled or 45mins from frozen until crisp and golden. Scatter over extra thyme and some flaky sea salt and serve. Preheat oven to 180C/. Line a baking tray with baking paper. Place pumpkin on the lined tray and drizzle with 2 tspn oil. Sprinkle with sage and fennel seeds and season with salt and pepper. Bake, turning occasionally, for 20 minutes or until beginning to brown. Meanwhile, heat half the remaining oil in a medium frying pan over medium-low heat. Add fennel and cook, turning occasionally, for 15 minutes or until tender. Add the sugar and vinegar and cook, turning, for 5 minutes or until caramelised. Place four 8cm (base measurement) fluted tart tins with removable bases on a baking tray. Place the filo pastry on a clean work surface and cut in half widthways. Place in a stack and cut into quarters to make squares. Lightly brush filo with a little remaining oil. Place 8 filo squares, rotating slightly, in the base of each tart tin, allowing the corners to extend over the edge. Bake in oven for 15 minutes or until golden brown. Divide the pumpkin and fennel among the pastry cases and bake for 5 minutes or until heated through. Meanwhile, to make the rocket and walnut pesto, process the walnuts, rocket and garlic in a food processor until finely chopped. Add lemon juice and oil and process until well combined. Season with salt and pepper. 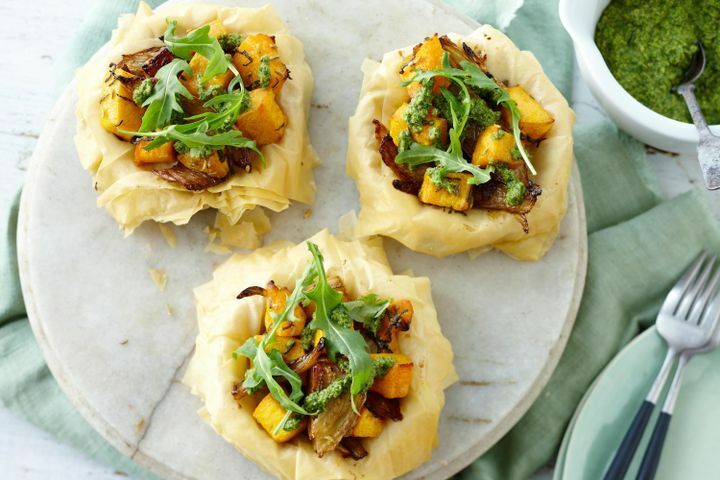 Serve pumpkin tartlets with a drizzle of pesto and some baby rocket leaves.